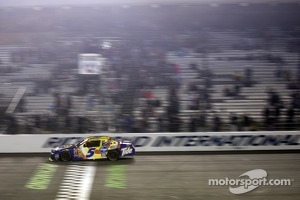 ToyotaCare 250 NASCAR Nationwide Series race that was delayed more than three hours by rain. 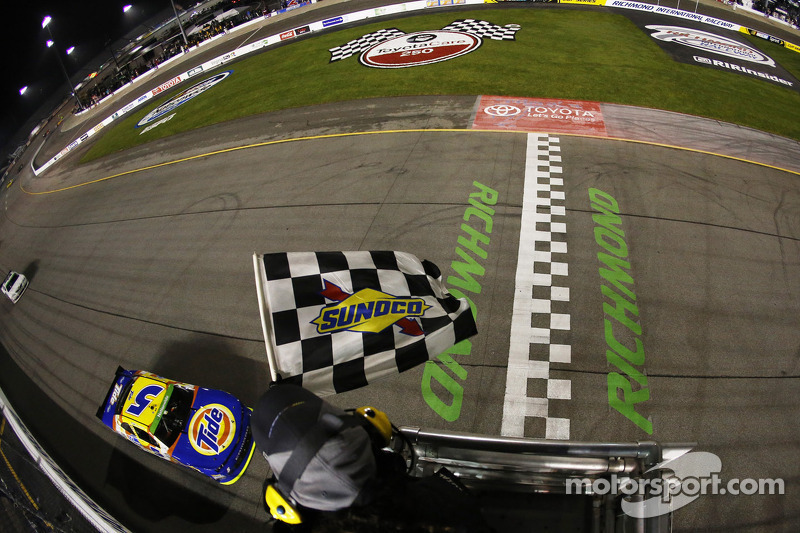 RICHMOND, Va. – As soon as Kevin Harvick took the lead in Friday night’s ToyotaCare 250 NASCAR Nationwide Series race at Richmond International Raceway, it was over. Harvick passed polesitter Brian Scott for the top spot on Lap 48 of 250 and led all but one lap thereafter in cruising to a dominant victory over JR Motorsports teammate Chase Elliott, who fell one position short in his bid to win three straight races. In an event that was delayed more than three hours by rain, Harvick led 202 laps in posting his series-best seventh win at Richmond, his first of the season and the 41st of his career. Kyle Busch ran third, followed by Kyle Larson and Scott. Elliott extended his series lead to 19 points of over Regan Smith, who finished eighth. 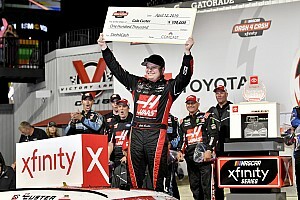 The victory was the fourth in eight NNS races for JR Motorsports and the first 1-2 finish for the organization. Harvick credited his teammate for pushing him. “Honestly, Chase is a good kid, and he knows how to drive a race car,” Harvick said. “He pushes us to be better by trying different things (from what we’ve been doing) through the years. The groove getting into in Turn 1—I had to change my groove tonight and change my car because it was different. Elliott, however, chided himself for not giving Harvick more of a battle after a restart on Lap 204. “We were just a little tight right in the middle of the corner,” Elliott said. “I think he just outdrove me a little bit. Honestly, I felt like some of it was me. I just let him get a little too far out in front of me there on the first few laps. 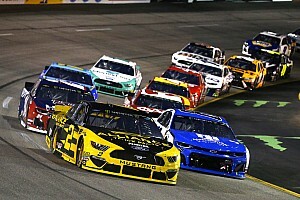 During a green-flag run that lasted 104 laps after a competition caution called on Lap 41, Harvick built a lead of more than eight seconds, and advantage that was reduced to slightly more than four seconds after a long cycle of green-flag pit stops. A caution on Lap 151 for debris in Turn 4, however, reset the field and gave all lead-lap cars (15 at the time) to come to pit road for tires and fuel. First out of the pit after the stops, Harvick led the field to green on Lap 162 with Elliott second and Scott third. Harvick pulled away after the restart, with Elliott in close pursuit, and those two drivers ran less than a half-second apart until contact from Ryan Reed’s Ford sent Dylan Kwasniewski’s Chevrolet into the Turn 4 wall to bring out the fourth caution of the night. Harvick and Elliott were 1-2 off pit road for a restart on Lap 197, and though another quick caution on the restart lap—when Regan Smith tangled with Elliott Sadler in Turn 2—slowed the field for the fifth time, Harvick was just as dominant after a restart on Lap 204. Gradually, Harvick pulled away from his teammate during the final 47-lap green-flag run and arrived at the finish line 2.069 seconds ahead of Elliott. 1. (9) Kevin Harvick(i), Chevrolet, 250, $42450. 2. (4) Chase Elliott #, Chevrolet, 250, $35950. 3. (8) Kyle Busch(i), Toyota, 250, $22475. 4. (14) Kyle Larson(i), Chevrolet, 250, $21675. 5. (1) Brian Scott, Chevrolet, 250, $30375. 6. (13) Elliott Sadler, Toyota, 250, $23225. 7. 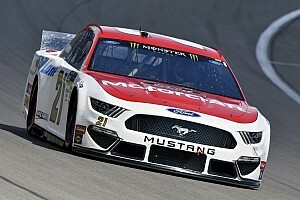 (7) Chris Buescher #, Ford, 250, $22885. 8. (6) Regan Smith, Chevrolet, 250, $23395. 9. (3) Ryan Blaney(i), Ford, 250, $21875. 10. (15) James Buescher, Toyota, 250, $22925. 11. (5) Trevor Bayne, Ford, 250, $21425. 12. (20) Ryan Reed #, Ford, 250, $21325. 13. (10) Landon Cassill, Chevrolet, 250, $21225. 14. (11) Ty Dillon #, Chevrolet, 250, $21175. 15. (17) Cale Conley(i), Chevrolet, 250, $15750. 16. (18) Mike Bliss, Toyota, 249, $21025. 17. (19) Dakoda Armstrong #, Ford, 249, $20825. 18. (33) JJ Yeley, Dodge, 249, $20725. 19. (12) Daniel Suarez, Toyota, 249, $20850. 20. (22) Brendan Gaughan, Chevrolet, 249, $21300. 21. (27) Blake Koch, Toyota, 248, $20550. 22. (28) Jeremy Clements, Chevrolet, 247, $20470. 23. (26) Joe Nemechek(i), Chevrolet, 246, $14395. 24. (25) Jeffrey Earnhardt, Chevrolet, 246, $20320. 25. (21) Josh Wise(i), Chevrolet, 246, $20395. 26. (16) Ryan Sieg #, Chevrolet, 246, $20545. 27. (29) Mike Wallace, Dodge, 245, $20145. 28. (35) Derrike Cope, Chevrolet, 245, $14070. 29. (32) Eric McClure, Toyota, 245, $20020. 30. (37) Josh Reaume, Chevrolet, 244, $20270. 31. (31) Joey Gase, Chevrolet, 239, $19895. 32. (2) Dylan Kwasniewski #, Chevrolet, Accident, 187, $19835. 33. (39) Mike Harmon, Dodge, Vibration, 112, $19795. 34. (38) Derek White, Toyota, Rear Gear, 58, $13685. 35. (23) Tanner Berryhill #, Dodge, Transmission, 27, $19606. 36. (40) Tommy Joe Martins #, Dodge, Suspension, 11, $12650. 37. (24) Matt Dibenedetto, Chevrolet, Electrical, 6, $12590. 38. (36) Jeff Green, Toyota, Vibration, 5, $12536. 39. (30) Kevin Lepage, Chevrolet, Accident, 2, $18420. 40. (34) Jimmy Weller III(i), Chevrolet, Engine, 1, $18380. Average Speed of Race Winner: 94.617 mph. Time of Race: 1 Hrs, 58 Mins, 54 Secs. Margin of Victory: 2.068 Seconds. Caution Flags: 5 for 36 laps. Lap Leaders: B. Scott 1-43; J. Clements 44-45; B. Scott 46-47; K. Harvick(i) 48-132; E. Sadler 133; K. Harvick(i) 134-250. Leaders Summary (Driver, Times Lead, Laps Led): K. Harvick(i) 2 times for 202 laps; B. Scott 2 times for 45 laps; J. Clements 1 time for 2 laps; E. Sadler 1 time for 1 lap. Top 10 in Points: C. Elliott # - 313; R. Smith - 294; E. Sadler - 290; T. Dillon # - 278; T. Bayne - 274; B. Scott - 265; B. Gaughan - 239; J. Buescher - 229; D. Kwasniewski # - 212; R. Reed # - 204.